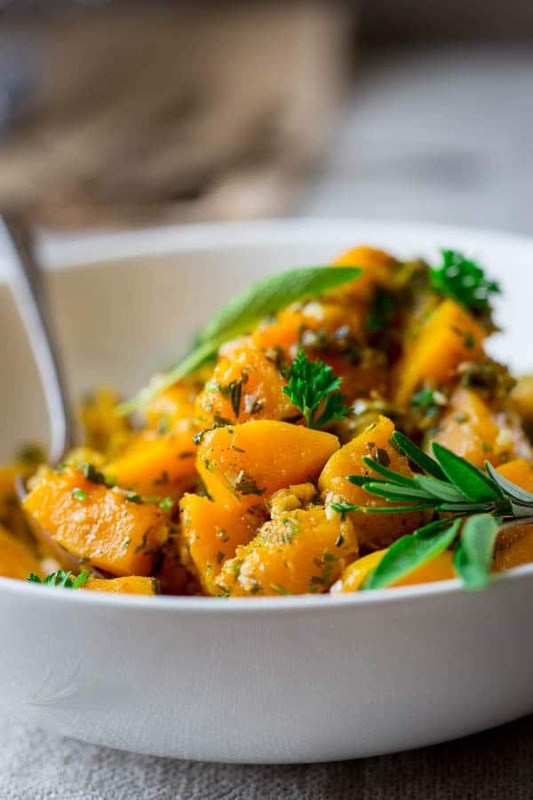 This garlic and herb steamed butternut squash is an easy but crazy flavorful side dish to add to your Thanksgiving menu. It is naturally vegan, paleo and gluten-free. It can be made entirely on the stove-top so it won’t have to jockey for a position in the oven. The technique to make this steamed butternut squash is really easy. Just cut up the butternut squash into cubes (about 1 inch each). If you want to buy pre-cut squash that is fine too! 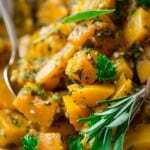 Use 8 cups of cubed butternut squash, or about 2 ¼ to 2 ½ pounds. If you are cutting your own, peel the squash first with a good vegetable peeler. Wash your hands afterwards since the vitamin A in the squash will actually start to break down the outer layer of skin, which results in roughed up dry palms. Then cut the squash in half and scoop out the seeds with a spoon. When I cut a butternut squash, I separate the rounded bottom part that houses the seeds from the long solid part. I find doing that makes it easier to cut the squash into evenly sized pieces. Once your squash is cut up. Steam it in a saucepan with a steamer basket. While that is happening, chop up some garlic and herbs. For the herbs, try to use about 1 part parsley and 1 part a blend of woody herbs, such as sage, rosemary and thyme. Don’t use 1/3 cup of straight woody herbs without the parsley or it will be medicinally strong. 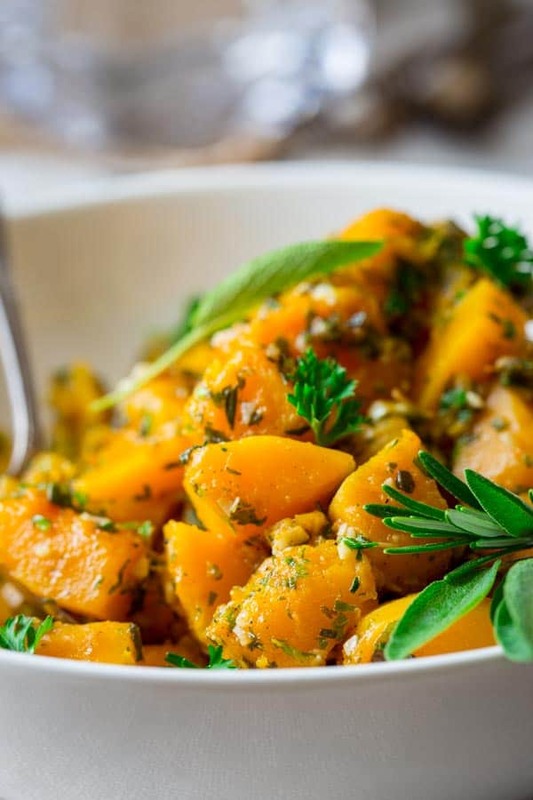 This steamed butternut squash recipe also works with tender fines herbs (parsley, chervil, tarragon and chives) but I think it’s better suited to serve with beef or fish. While the squash is cooking, cook the garlic in the oil. I go heavy on the extra-virgin olive oil but you can use less if you’re trying to cut calories. I think it is really nice to have a generous coating of the oil, because it keeps the squash moist and carries the savory flavors. Plus, this recipe makes enough for 10 people, so you are not going to even get a full teaspoon of oil per serving. Note that it is important to watch the garlic while it sizzles in the oil. You want it to start to brown, otherwise it is too strong and raw tasting, but you also don’t want to take it to the point where it is toasted or burnt. As soon as you see color on the garlic, transfer the garlic and oil to a large mixing bowl. The room temperature bowl will stop the browning of the garlic. Then immediately add the herbs, to bloom them in the hot oil. 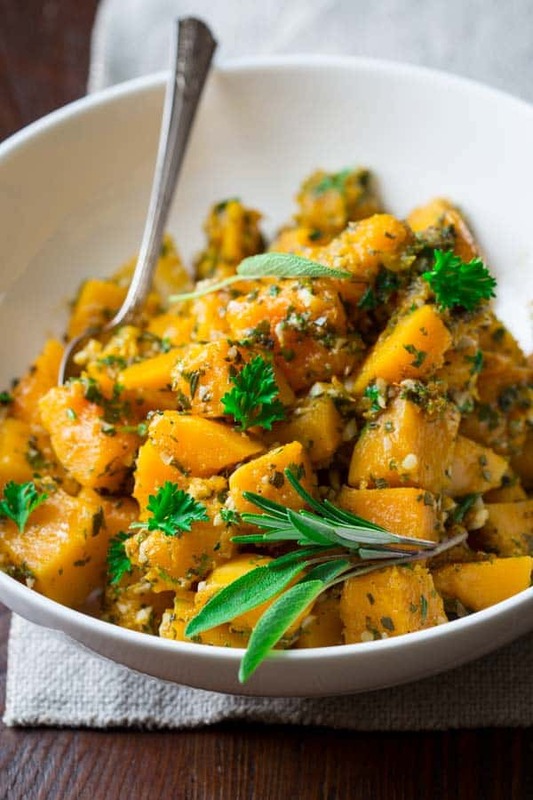 Once the squash is tender (just check it with a fork to see if it is cooked through) lift the steamer basket carefully out of the saucepan and tip the squash into the bowl with the garlic and herbs. Add some salt and pepper and toss everything to coat. If you overcooked the squash by mistake that is fine, but be very gentle while stirring so you don’t end up with mush. Transfer the squash to a thick ceramic serving dish, and cover. Keep warm until everything else is ready. Don’t fret if the garlic and herb steamed butternut squash goes cold while you’re preparing the other Thanksgiving dishes. If this happens, you can reheat the squash in the microwave in just a few minutes. Just make sure to reheat the squash in shorter intervals to avoid overcooking the squash. Ever 30 seconds or so, test the squash to see if it’s heated through and continue cooking accordingly. You can also reheat the butternut squash in the oven, assuming you have room for it. Just make sure to keep the baking dish covered! This easy garlic and herb steamed butternut squash is a healthy gluten-free and vegan side dish for Thanksgiving (or any winter gathering!). Bring 1 inch of water to a boil in a large saucepan fitted with a steamer basket. Add squash to the basket, cover and steam until the squash is tender, 13 to 15 minutes. Meanwhile, heat oil in a small skillet over medium heat. Add garlic, and cook, stirring often until the garlic is fragrant and just starting to brown slightly, 1 to 3 minutes. Immediately pour the garlic and oil into a large mixing bowl, add herbs and stir. Add the cooked squash to the garlic herb mixture. Add salt and pepper and gently stir to combine. Keep warm until ready to serve. A 2.75 pound squash (untrimmed with seeds and peel) yields 6 cups cooked squash. A large squash will work great, but you’ll have to add a pinch more salt. Just taste to see. I love the sweet and savory aspects of this dish. It looks wonderful! Katie, this sounds wonderful! And looks heavenly! I did not know that “the vitamin A in the squash will actually start to break down the outer layer of skin” – I learned something new because of ya! Thanks bunches! Your pictures are DIVINE! I usually roast butternut squash and it takes way longer than what your recipe says steaming does so I must try this! Definitely on the Thanksgiving menu! 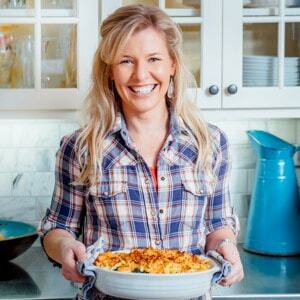 I love this – and I make this almost every weekend. 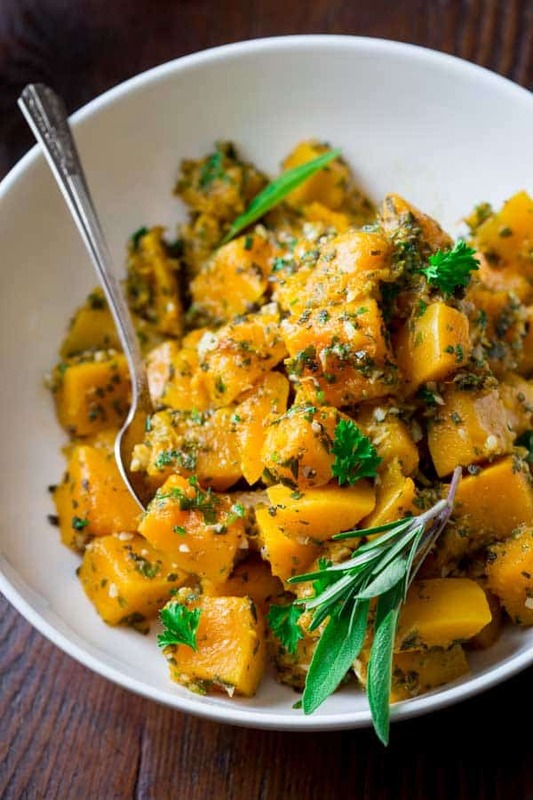 I love roasted butternut with garlic and herbs! This is why fall and winter is okay 😛 Squash season! I absolutely LOVE squash, especially Butternut. It’s my favorite ever since I was a kid. 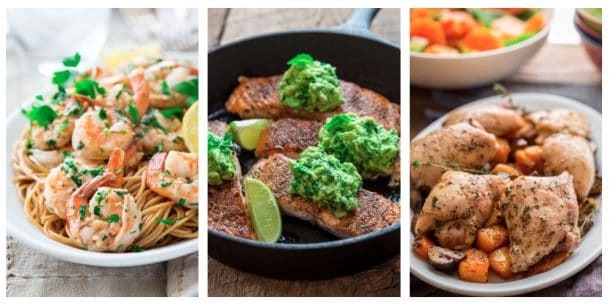 I’m so glad I found this site and this recipe! Can’t wait to try it, and it’s so pretty too! Thanks for sharing this! YES to anything squash! looks SO good! This is so simple! And it goes with everything!!! I could eat this for every meal and snacks in between! 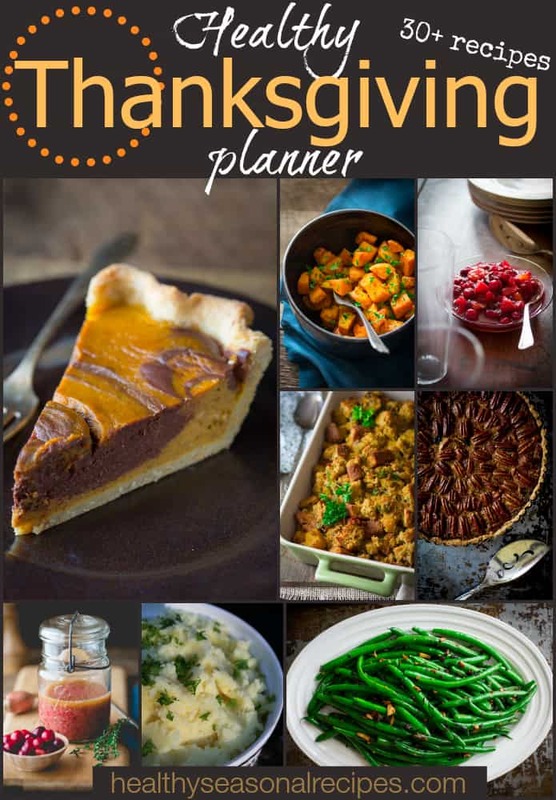 I’m always looking for different ways to mix up the Thanksgiving menu so this it definitely going on the list! What a great idea for squash!! What a great fall side dish! I love how easy it is. Can you cook this a day in advance? Trying to triage my Thankgiving meal! Jenn, You can! The last time I made it, the left-overs heated up beautifully in the microwave. The herbs won’t be as vibrant the second day- but the flavor will be all there! Try sprinkling on an additional pinch or two of fresh chopped parsley just before serving to liven up the green. Hope you have a wonderful Thanksgiving, and please reach out here or on FB if you have any other questions. Thanks Katie!! Really looking forward to this dish!! Happy Thanksgiving to all of you!! !